I never met Howard Reig, the former announcer for NBC and specifically NBC Nightly News but his great service and the retirement of his voice was well covered on these pages. And as a fellow voice talent, I consider him a friend of sorts. So it is with a heavy heart that I note the passing of my friend Howard at age 87 at his home in Venice Florida. I’ve noted before how difficult it was to replace him as an announcer and I am sure that same sentiment is now felt by his family, magnified to infinity. I am so sorry for their loss. 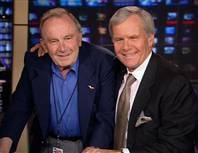 NBC News’ Brett Holey wrote this tribute to Howard in 2007 and it is wonderful. Here is a wonderful tribute site Howard’s son created for his Father. Requiescant in Pax, sir. I was a fan.